After making this salsa and tasting a few spoonfuls, I found myself wishing for a big bag of chips. This was a spur-of-the-moment sort of dinner, where I had planned to cook steak with some kind of quinoa salad, but hadn't fully thought through the details yet. And so I just started pulling out ingredients that sounded good... red quinoa, black beans, carrots and green onions for the salad, seasoned with a little olive oil, lime juice, salt, pepper and fresh cilantro. So pretty and colorful, the salad looked like fall. I have somewhat overcome my aversion to cilantro, and have learned to appreciate the freshness it adds to some of my recipes, but I do still feel like a little of it goes a long way. 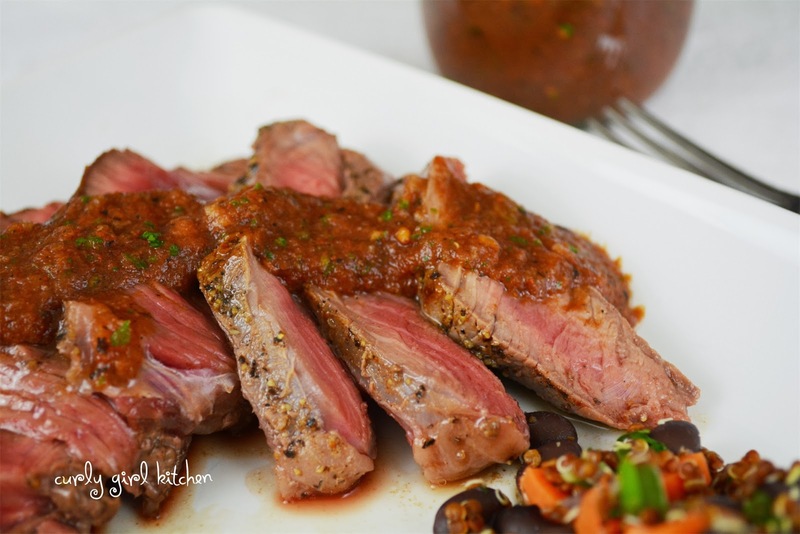 I gave the steak a simple sprinkling of salt and pepper, with a little chuck-wagon steak seasoning I found at the back of a cupboard, and then started making a pile of items for salsa. Canned fire-roasted tomatoes, cilantro and onion, a splash of red wine vinegar, and plenty of spices, including smoked paprika, a recent favorite spice of mine. Which happens to be available quite inexpensively at Costco, much to my happiness. 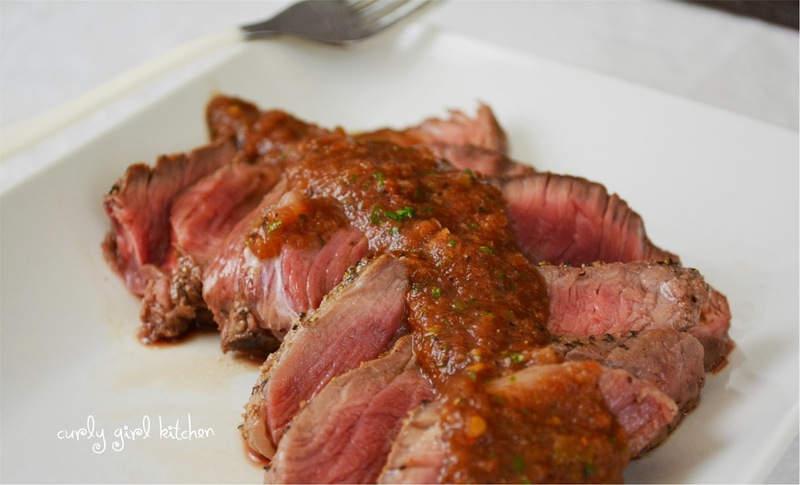 In a blender, puree the tomatoes, cilantro, onion, red wine vinegar, chili powder, garlic powder, salt, smoked paprika, cumin and cayenne pepper until smooth. Pour into a jar and refrigerate until ready to use. Season the steaks with salt and pepper, or your favorite steak seasoning. Grill or cook in a cast iron pan to your liking. 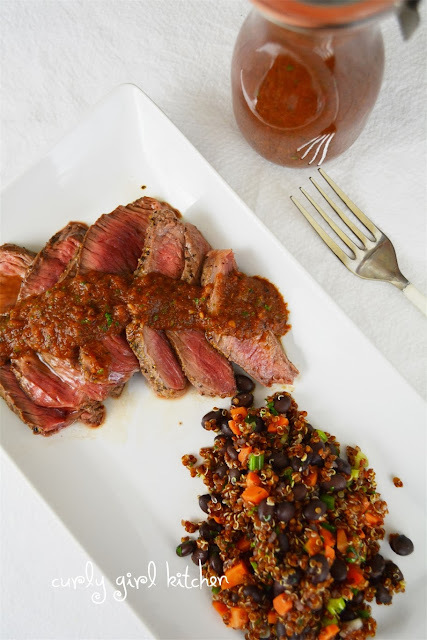 Top the steak with the salsa, and serve with the quinoa black bean salad. Salsa recipe yields about 2 cups of salsa. Combine the quinoa and water in a medium saucepan; cook according to the instructions on the box. 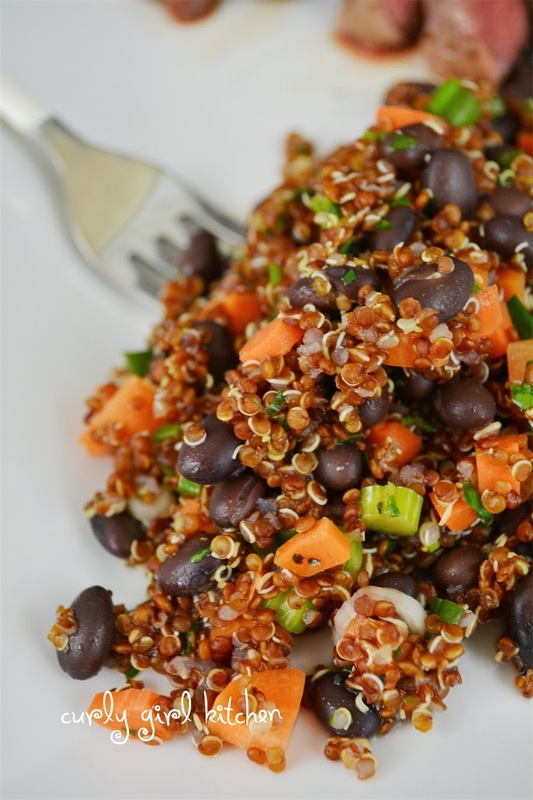 When the quinoa is cooked and all the water is absorbed, remove from the saucepan from the heat and mix in the black beans, carrots, onions and cilantro. Drizzle with the olive oil and lime juice; add the salt and pepper and toss. Serve warm or room temperature.